TD Ameritrade is one of the biggest online brokers. It’s won many awards and receives high ratings from the financial press. That all sounds great, but it’s not why I use it. The broker you use is just as important as how you invest your money. While there are a lot of good online brokers to choose from, it makes sense to choose the broker that best fits your investment needs. In the end, TD Ameritrade meets all of these and it’s why I use it today. I’ve been a customer since 2005. This TD Ameritrade review should help you answer some questions, including whether it’s the right broker for you. When you invest, more information is key. TD Amertirade offers a wide array of research tools for every investor – including both fundamental and technical analysis. Stock, Options, ETF, and Mutual Fund Screener – build and save your own screens or use the predefined screens. Third Party Research – Morningstar, The Street, Credit Suisse, S&P Capital IQ, Market Edge, Jaywalk Consensus, Ford Equity, Vickers, and more. Custom Stock Charts – spot trends and opportunities based on your parameters and technical analysis. Real Time Market News and Data – staying up to date on all the information is important. myTrade Community – share ideas with other traders. Virtual Trading and Backtesting – test your strategies based on real historical data. The research tools are the biggest selling point. I would rather pay a slightly higher commission for all the free research tools possible. TD Ameritrade doesn’t skimp on that end. The TD Ameritrade website is the easiest way to place orders. That’s were I place most of mine. You just enter the ticker symbol, quantity, order type, and buy or sell. That’s it. It’s perfect for the long-term investor and easy for beginners to figure out. Trade Architect – is a customizable browser-based platform built for active traders to identify trends through heatmaps, research, and real-time news. thinkorswim – is the profession level platform for serious traders to analyze and test strategies, comprehensive charting, order management, market scans, and more. You also get two mobile apps, plus the mobile website for the investor on the go. If you don’t know, costs are a big drag on your investment returns. So anytime you can cut a cost entirely, it’s worth it. For long-term investors, or just ETF investors, the commission free ETF is a big plus. 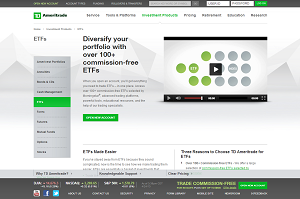 TD Ameritrade first offered commission free ETFs back in 2010. Since then only a few other online brokers have stepped to the plate with similar offers. It’s one of the big advantages that separate TD Ameritrade from its competition. There are over 100 commission free ETFs in total. These are low-cost ETFs too. The expense ratio ranges from 0.05% to 0.50%. It’s everything you need to build a great retirement portfolio, college savings account, or just a simple brokerage account. Most of the no fee ETFs are from the iShares, Vanguard, and SPDR fund families. The choices range from equity, bond, international, sector specific, and commodity funds. You can easily build a long-term retirement strategy with just commission free ETFs. There is one caveat though, you must hold these ETFs for at least 30 days. If you sell before then, you get hit with a short-term trading fee. For a long-term investor, this shouldn’t be problem. Help is easy to come by with phone, email, online chat, in person at a local branch, and the easy to use Ask Ted feature. I haven’t had to use any of them since I opened my first account years ago. A lot of that has to do with the educational tools available and the little help center buttons in all the right places that will walk you through the basics. On top of that, I get a couple of phone calls every year from the local TD Ameritrade branch. They just check in, see if I have any questions, concerns, and how they can help. I’m still waiting for the day, they try to sell me something. As far as I’m concerned, TD Ameritrade is the best online broker around. It’s great for beginners, long-term investors, and has the advanced tools any trader needs. I understand some people only want lower commissions. If so, then choose a discount broker. But you miss out on the research tools, education, trading platform, and commission free ETFs. But if those things are important to you, open an account with TD Ameritrade, it’s hard to find a better online broker around. Open an account today using one of these TD Ameritrade promotions!